Product prices and availability are accurate as of 2019-04-02 07:40:56 EDT and are subject to change. Any price and availability information displayed on http://www.amazon.com/ at the time of purchase will apply to the purchase of this product. 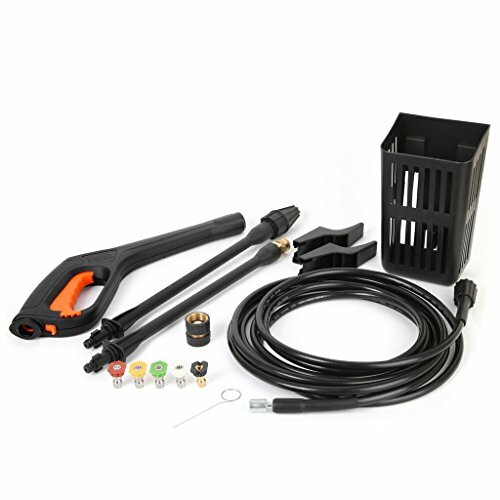 This innovative Power Washer power washing system from Ivation is designed for optimal versatility so you can perform diverse cleaning tasks for your home, vehicle, patio, lawn equipment, and much more with remarkable ease. 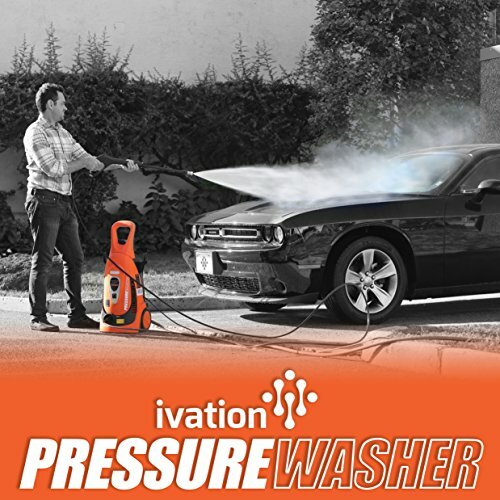 The powerful 2,200-PSI pressure washes and cleans a wide variety of surfaces, while the washer itself boasts effortless setup and even includes a convenient pump auto-shutoff. From walls to floors, wood to concrete, trucks to RVs and beyond, tackle every tough job with one powerful, effective washing system! 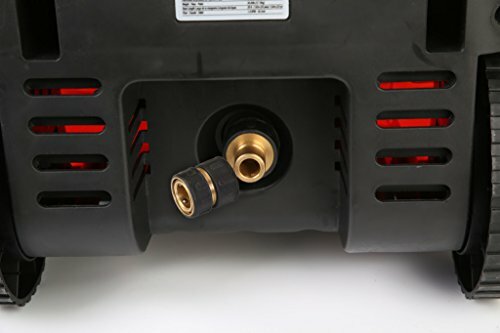 Here are the numbers: The 14.5-amp, 1,600-watt motor generates a water flow rated at 1.8 GPM and 2,200 PSI pressure for maximum cleaning and scrubbing power. Remove loose paint, mold, grime and tough dirt from nearly any surface. The 5 interchangeable quick-connect nozzles, copper-connected gun hose, and tap adapter easily click in for a convenient 30-second setup. The self-suction feature even enables the use of standing water if no garden hose is available. A $25 value, this wand provides ideal maneuverability for hard-to-reach areas including second stories and vehicle undercarriage. The diverse nozzle selection supplies the perfect stream and pressure for every surface - tough to delicate. 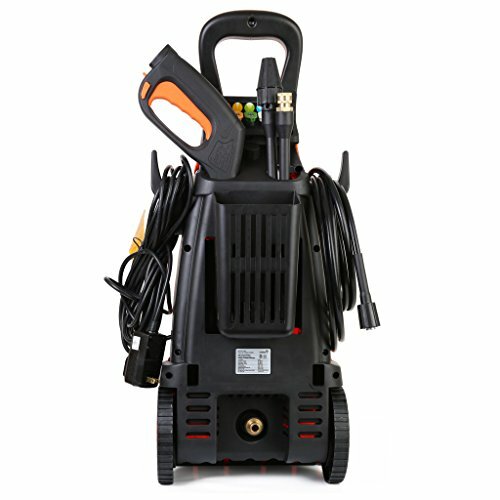 Featuring TSS technology, this pressure washing system automatically triggers the pump's shutoff when the gun is not in use. The versatile unit even contains a detergent dispenser for deeper cleaning. 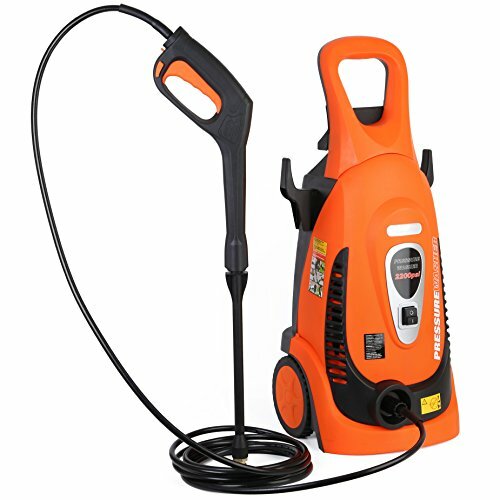 It's the one pressure washer you need for everything from structures to vehicles, boats, decks, driveways, patios, and lawn equipment. Simply attach your desired nozzle and eliminate all manner of stubborn grime, gunk, oil, rust, and mildew. DISCLAIMER: Make sure water supply is on or the motor will die. 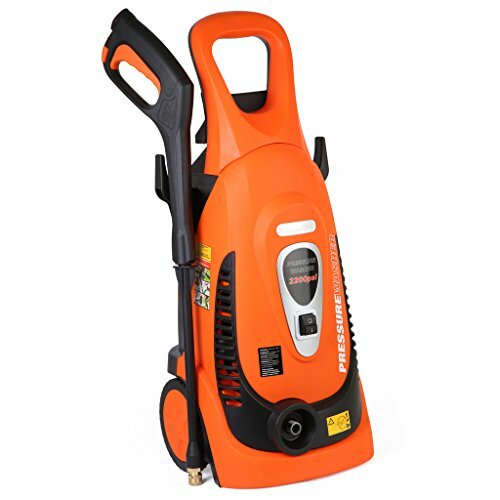 Incredible Cleaning Power Generated by the 1800 Watt/14.5 amp Motor Outputs a Whopping 1.8 GPM and 2,200 PSI Pressure for Maximum Cleaning and Scrubbing Power 5 Interchangeable High and Low Pressure Nozzles Wash Various Surfaces (0º, 15º, 25º, 40º and soap); Bonus Turbo Wand Included Easy-to-Use System Requires Just 30-Second Setup w/Three Simple Attachments, The Unique Copper Connections are Easily Joined to Hose and Nozzle for Quick, Effortless Hookup Power Washer Features Safety Automatic Total Stop System (TSS), Optional Self Suction, & Soap Dispenser Ideal Pressure Cleaning Solution for all Types of Vehicles, Cars, SUV's, ATV's, Boats, RVs, and Homes, Driveways, Decks and Patios, Easily Gets rid of Dirt, Grime, Gunk, Oil, Rust, Mildew and Grease and the Toughest Spots - Includes a 1 Year Warranty - DISCLAIMER: Make sure water supply is on or the motor will break.